Get your Teen out of the house, away from the video games, off the computer, and away from the TV. Give them the gift that will empower them throughout their life. Our Teen Martial Arts program will teach them to step outside of their comfort zone, face new challenges, and set long and short term goals while they develop good social skills, and physical fitness in a positive environment with peers. Whether you're brand new the Martial Arts or you've earned a rainbow of belt colors, World Martial Arts Academy's Teen Karate program will get you in great shape while teaching you incredible Karate and Martial Arts skills in a safe and fun environment! 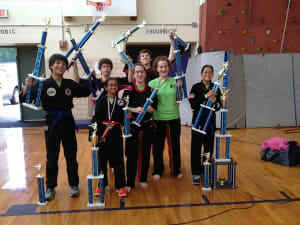 Our Teen Karate program is designed to provide a fun, educational, and exciting environment where students will learn self-defense through a combination of traditional Karate curriculum, while also offering practical techniques to protect yourself in any situation. We Build Individuals With Strong Character, Strong Values & A Confident Attitude! The best time to begin making confidence, fitness, and self-defense part of your life is now! Karate provides a healthy break from routines at school, home, and work. Fill out the short form on the side of this page to get all the information you need to get started with World Martial Arts Academy's Teen Karate program today!